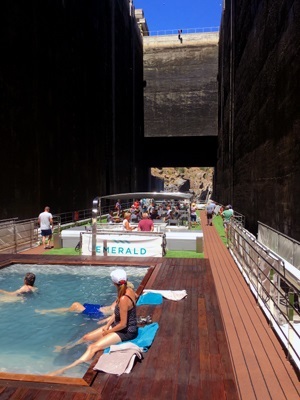 Cruising the Douro River offered a lesson in engineering as Emerald Waterways’ Emerald Radiance passed through five locks on its way east across Portugal. All five were completed in the 1970s and ’80s for flood control, power generation and ease of navigation from the mouth of the river near Porto to the border with Spain about 210 kilometers away. 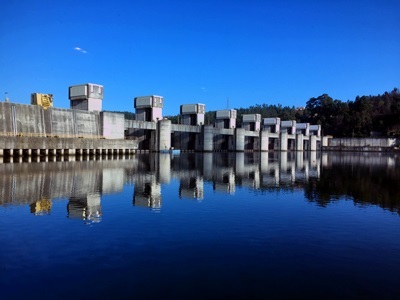 The largest of the five locks, at the Carrapatelo Dam, was the first built and the difference in the water level is around 35 meters making it one of the highest lock and dams in the world. The downstream gate closes like a guillotine. Emerald Radiance is four decks high, so before we entered the lock canopies on the top sun deck had to be taken down, along with the ship’s navigational tower and poolside shower. The pilot house was lowered. As the water level inside the lock rose, the captain instructed us up top to stay seated as the ship passed under a bridge over our heads. He remained standing and, though not a tall man, he had to duck. Passing motorists got out of their cars and gathered along the railing to watch the spectacle. Two motorcyclists wearing helmets gazed down on us. I thought they looked like aliens from a sci-fi film. The locks made river cruising on the Douro possible, with the first vessel arriving in 1986. Now Emerald Waterways and its sister line, Scenic, are among five lines with itineraries on the river. 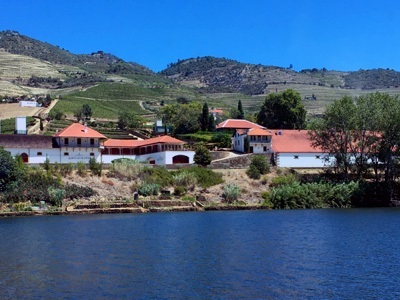 Tourism has become big business in the Douro Valley. Carla, one of Emerald’s tour escorts, told us in an afternoon briefing that the river is named for the Portuguese word for gold. It earns the title not so much from the revenue recently generated by visitors, but by its long history of wine production, especially port wine. As she spoke in the Emerald Radiance Horizons Lounge, we looked through floor-to-ceiling windows at vineyards sweeping down in terraces along the river’s banks. Vines grow in neat rows behind stone fences; winery buildings glow white among the green. In the old days, Carla told us grapes were picked by hand and transported in wicker baskets to the wineries. Barrels of wine were sent to warehouses down river in rabelos, small wooden sailboats. Production now has been mechanized and modernized and the boats are used for tourist excursions. Wine bottles the world over are traditionally sealed with cork stoppers. Most of that cork comes from Portugal where it’s a crime to cut down one of these valuable trees. We learned this and more about cork in an on-board presentation given by the Douro’s “Cork Lady” Paula Guimaraes. Emerald and Scenic book her as part of their enrichment program for passengers. Paula explained how cork is harvested from the tree’s bark and that it can be made into a variety of products from flooring to fabrics that can be sewn as clothing. 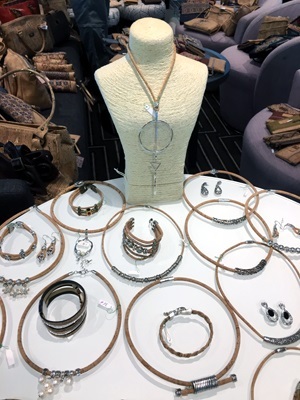 She brought dozens of her creations with her, laying out jewelry, wallets, belts and hats for sale on the tables and sofas of the Horizon Lounge. She did a brisk business, too. Because the Emerald Radiance is a small vessel, its “store” consists of a couple of display cases in a corner of the first deck. Passengers seemed to welcome another opportunity for shopping on board. I vowed to abstain because my jewelry box at home is already crammed with trinkets purchased on my travels. A necklace of cork with silver adornment caught my eye, though, and I couldn’t resist. Can a woman really have too much jewelry?